For the first time, Marshall University’s Cricket Club competed and placed second in the 2016 Ohio State University Cricket Tournament. Cricket, a game played between two teams of eleven players each, allows one team to bat and score runs while the other bowls and fields the ball in an attempt to restrict the scoring. The objective of the game is for a team to score more runs than its opponent, according to Rakesh Bangaru, president of the university’s cricket club. Bangaru said Marshall’s cricket team was established earlier this month, which only gave it two weeks to get ready for its first tournament. Cricket is a sport played in 100 countries across the world, according to Yogan Sarika, vice president of the Cricket Club and captain of the team. In addition to receiving a second-place trophy, Ilesh Patel received the Most Valuable Player and Player of the Tournament awards and Nirav Patel got the Best Bowler Award. The team will move on to compete in the Western Regional Tournament in Detroit Oct. 1-2, with nine universities competing for the title. Marshall University will play Northern Illinois University and Wayne State in the first round, with opportunities to play universities like Kent State, Penn State and the University of Toledo in the subsequent rounds. If Marshall wins, it will have the opportunity to compete against cricket teams across the country at the national tournament in Florida in March 2017. Both Bangaru and Sarika agree the cricket team needs more resources and help with funding to ensure future success. To learn how you can contribute to Marshall’s Cricket Club or for more information about joining the team, contact bangaru@marshall.edu or sarika@marshall.edu. Interested students can also follow their Facebook page at Marshall University Cricket Club. 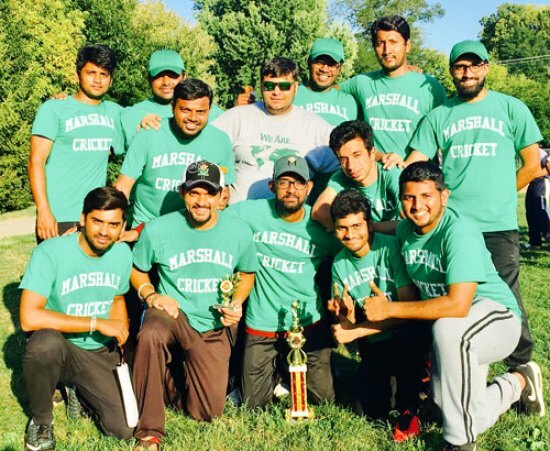 The Marshall University Cricket Club is sponsored by the Office of Student Affairs, the Office of Intercultural Affairs and INTO Marshall under the supervision of Faculty Adviser Jamil Chaudry.